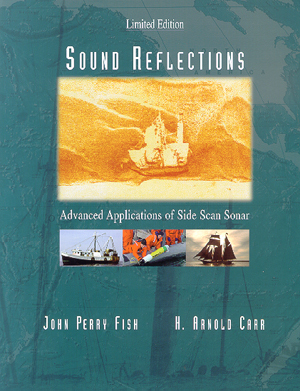 Sound Reflections, by John Perry Fish and H. Arnold Carr (2001), is a more advanced reference text that discusses the more complex and demanding applications of side scan sonar. Once the sonar user is familiar with the concepts and theories explained in the basic primer text, Sound Reflections is the next logical reference text to use. The book provides an in-depth look at the diverse range of sonar applications and discusses advanced data interpretation. Different sonar design technologies are outlined with examples from a variety of sonar types. Sound Reflections is comprehensive in its presentation and authoritative in providing field-proven principles. Chapter topics include: - Developments in Side Scan Sonar Technology - Bandwidth and Chirp Sonar - - Imaging Small Structures - Imaging Large Structures - - Image Density in Sonar Data - Sonar Phenomenon - - Aircraft and Aeronautical Debris - Imaging Wide Area Formations - Features: a Glossary of sonar terms and their meanings, 272 pages, color, 422 illustrations, hard binding.